Has been cleaned/sterilized per manufacturers specifications. Any used product. There is one 2.5, one 3, one 3.5, one 4, and one 5. You will receive 4 Scanlan vascular dilator and one Codman vascular dilator (only what is pictured). There will only be a warranty if the item stays in the United States. 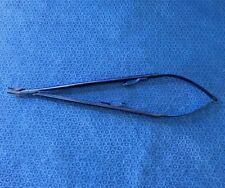 1 - SCANLAN 6006-50 CASTROVIEJO NEEDLE HOLDER. DIAMOND DUST JAW 5 3/4" (14.5CM). 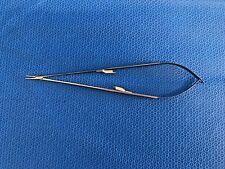 Scanlan 3003-238 Jacobson Titanium Micro Needle Holder Diamond Dust Curved Jaws w/ Lock. has been cleaned/sterilized per manufacturers specifications. Any used product. subject to FDA regulation, I will verify your status as an authorized. 3003-93A Straight jaws. (and smaller) 6”. With ratchet 5-0. Scanlan 6006-36 Micro Needle Holder, 8.75"
“The sale of this item may be subject to regulation by the U.S. Food and Drug Administration and local regulatory agencies. Warranty: 6 Months (Covers OEM Defects). Never used afterwards. Richards Micro Needle Holders, Extra Fine Straight DIAMOND DUST™ Jaws, Ring Handle. Scanlan 6006-32 Straight jaws, 5-0 (and smaller), 7 1/4 ″ (18.5 cm). "The sale of this item may be subject to regulation by the U.S. Food and Drug Administration and state and local regulatory agencies. Scanlan 6006-28 SCANLAN® Micro Straight Jaws Suture Size: 5-0 and Smaller 7 1/4″ (18.5 cm). Read more. "The sale of this item may be subject to regulation by the U.S. Food and Drug Administration and state and local regulatory agencies. "The sale of this item may be subject to regulation by the U.S. Food and Drug Administration and state and local regulatory agencies. If for any reason you feel you haven?t received ?. THIS IS BEING SOLD AS-IS WHAT YOU SEE IN THE PICTURE IS WHAT YOU WILL BE GETTING. KATENA K6-3751. Anis Needle Holder, straight. Anis Needle Holder, straight. "The sale of this item may be subject to regulation by the U.S. Food and Drug Administration and state and local regulatory agencies. If for any reason you feel you haven?t received ?. "The sale of this item may be subject to regulation by the U.S. Food and Drug Administration and state and local regulatory agencies. If for any reason you feel you haven?t received ?.